You need programs? We've got plenty! Here are twelve flexible programs designed to delight, entertain and sometimes even educate your cast members and audiences. From January to December, there is a program for each major holiday marked on your school calendar. 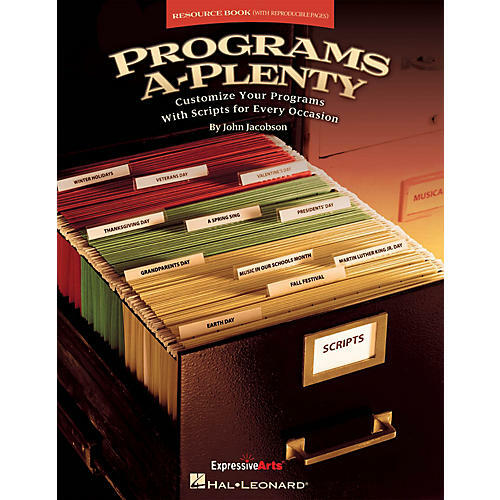 Programs A-Plenty provides all the dialog, and gives suggestions for songs that could be incorporated in each program. Some of the songs may be new to you, and others may already be in your cast's repertoire. You can choose to perform one or more of the songs from the list, or substitute for another song that best delivers the message you want to say. The key word is flexible. We encourage you to take the script provided and make the programs your own. Happy Holidays - every one of them! Holiday Scripts include: A Fun, Festive and Fantastic Fall Festival; Grandparent's Day: It's All About You; Patriotic Program: I Am America; Veterans Day; Thanksgiving Day; Winter Holidays: The Signs of Winter; Martin Luther King, Jr. Day: We Are the Dream; Hip Hooray, It's Valentine's Day! ; Presidents' Day; Music in Our Schools; A Spring Sing! ; An Earth Day Celebration. Available: Resource Book (with reproducible pages). Suggested for grades 2-5.